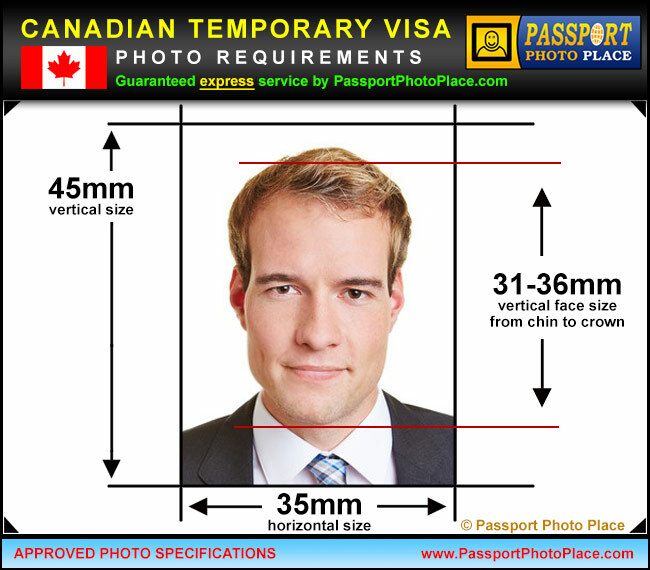 Passport Photo Place provides rush service for Canada temporary visas for both printed and electronic photo formats. We take and print all types of Canadian visa pictures that comply to the exact picture requirements as provided by Canadian government. There are three types of temporary resident visas – single-entry visa, multiple-entry visa and transit visa. To book a photo session for Canadian visa picture service email or call our Orlando, FL Orange County photo studio at 321-236-1105. Canadian Consulate General advises to utilize only a professional legal passport photo studio to avoid lengthy delays and visa application rejections. Passport Photo Place provides visa picture services that are in complete compliance with the official Canadian Embassy requirements. Taking the proper pictures in the first place facilitates normal application processing times and approval of the Canadian temporary visa applications. Our legal photo studio offers professional Canadian visa photograph services that feature digital image files for uploading with online Canadian visa applications and printed pictures. Guaranteed Canadian visa photo service. No picture rejections! All Canadian visa photographs are produced following the exact and recently updated 2019 photo requirements as established by the Embassy of Canada. The visa photographs are taken and printed by a professional photographer on-site. The photographer exclusively specializes in all passport and visa photography for immigration and travel documents. Passport Photo Place prints pictures that look great and of a professional studio quality. All photographs are printed using the latest digital photo printing technology that allows us to consistently provide the quality that fully complies with the official Consulate General of Canada requirements. The face size from chin to crown must be between 31 mm (1 1/4″) and 36 mm (1 7/16″), which will depend on the complexion and hairstyle of the person. Non-tinted prescription glasses are acceptable to appear in the picture as long as the eyes are clearly visible and the frames are not thick. Canadian temporary visa pictures are to be printed using a professional non-inkjet based full color printer that is capable of producing pictures at 300ppi and above. Please wear a solid-colored top/shirt. White or slightly off-white tops are not recommended since the background for Canadian visa photographs is light gray and there must be a good contrast between clothing and the background.